The community of global avatars through Gravatar actually started out very small. But the popularity of such an application has grown to scale millions of users with many more millions of different avatars. You can perform some really cool effects with gravatar photos, and I want to demonstrate a small sample in this tutorial. We will be coding a simple user login box with e-mail/password fields. After the user enters a successful e-mail address we’ll pull any Gravatar associated with the account and display the image results via Ajax. In order to pull the MD5 hash we’ll use a couple lines in PHP. However even a complete beginner shouldn’t get lost since the source code is very structured and easy to understand. 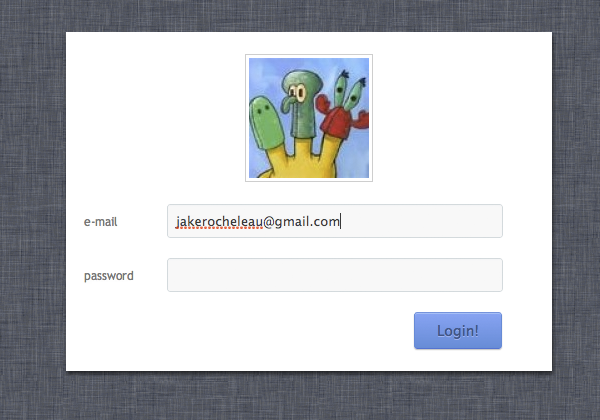 In this demo I’m using a very simple centered container area housing the login form. In the header I’ve linked an external stylesheet file styles.css, along with including the latest jQuery library through Google’s CDN. The form itself is broken up into horizontal sections with a div at the top for the user avatar image. By default we’ll display the generic Gravatar icon and only try to update after the user has typed a valid e-mail address. I’ll target the e-mail input field with the ID attribute and we can check the value using jQuery. But first let me point out some notable expenses in the stylesheet. In the stylesheet document I’ve attached a repeating background image tile similar to Apple’s iCloud website. I’ve tried to match the input fields with a similar color and dimension of design aesthetics. Underneath both the form fields I’m also using a set of CSS gradients to design the button. Hover and active events trigger to reverse the glossy gradient and appear more flat. Also the slight text shadow is a clever touch, and admittedly this is one of the first page elements you’ll notice. Many of these attributes can be updated or replaced to suit your own website. Color schemes and design styles will change, but you can always mix-and-match to suit your desires. Now that we have the basic HTML5/CSS3 layout developed it’ll be easier explaining how we can connect into Gravatar with jQuery and PHP. Each time the user presses a key when typing inside the e-mail field we want to check their current value against a generic e-mail address. There are many regex commands to use, and for this tutorial we’ll look at a super simple example. After the DOM finishes loading we need to check for keyup events only inside the #email input. But before this event handler I’ve coded a regex variable which we’ll test against the user’s input value. Following the keyup event we can setup another variable which holds the current text inside #email. Gravatar can display images with just a simple URL hack by creating an MD5 hash of the e-mail address. This will in turn look something like http://www.gravatar.com/avatar/MD5HASH. If you need an image value returned you may append the .jpg file extension. But in this example I’m setting a specific size value so we get 120×120 images. But in short, this function will only return true if the e-mail address matches up correctly. If true then we call a new Ajax method which connects into a backend script md5.php. We’re passing a new variable which contains the current e-mail text entered by the user. Then inside the return function we’re appending the new MD5 hash to the Gravatar URL and updating the top Gravatar image src attribute dynamically. In the first line I’m running some functions on our dynamic variable $_POST[’email’]. This is passed over via jQuery, so I’m stripping out any excess whitespace and also forcing all letters into lower case. Then with a simple call to the PHP md5() function we can get our string value and echo it onto the document, which in this case returns the value back to jQuery. This is such a unique effect which can work well on nearly any website. WordPress or Joomla! based CMS websites running many users can enjoy the benefits, although mostly aesthetic, each time you log in. And there are plenty of other scenarios where you can pull a user’s gravatar image dynamically for some cool effects. Download a copy of my demo source code to play around with, and feel free to share your thoughts in the post discussion area below.